FEND FABRIC - Intelligent Surface Protection Fend Fabric & Footwear is a spray on solution which dries to form a 100 nanometer-thin, clear, flexible coating. It can be applied to almost any fabric. Fend Fabric & Footwear can sprayed on easily, creating a hydrophobic (waterproof), anti-micr.. FEND GLASS & CERAMIC - Intelligent Surface Protection Keep your glass and other glazed surfaces cleaner and clearer with Fend Glass & Ceramic. Fend Glass & Ceramic is a spray on solution which dries to form a clear, flexible coating. It can be applied to almost any hard, non-pourous sur.. FEND OUTDOOR SURFACES - Intelligent Surface Protection Fend Outdoor Surface is a spray on solution which dries to form a clear, flexible coating. It can be applied to almost any pourous outdoor surface. 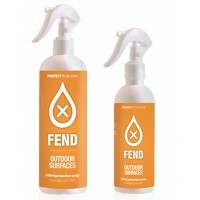 Fend Outdoor Surface is sprayed on easily and left to dry, creating a hydrophobic (waterproof), ..